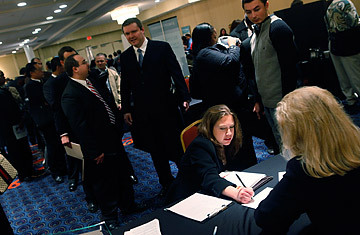 Job seekers wait in line for a résumé critique during a job fair in Oak Brook, Ill.
Democrats in Congress know the gravy train will soon be coming to an end. They raised discretionary non-military spending 8% in the 2009 budget and another 7% in the 2010 budget, and polls show that GOP accusations of profligate spending are starting to resound with voters; the White House has indicated that President Obama plans to use his State of the Union speech in January to outline his plan to draw down the ballooning deficits. But if voters are concerned about spending, they're even more worried about unemployment, which is at a 26-year high of 10.2%. And so, even as the economy seems to have stabilized and priorities such as health care, climate change and Afghanistan fight for a dwindling pool of federal money, there's one piece of legislation that is almost certain to get passed: some form of a jobs bill. Of course, given how little money Democrats have left to play with, any kind of second stimulus would have to provide a big bang for the buck. House and Senate leaders are looking at combining extensions of unemployment insurance, food stamps and health insurance for recently laid off workers (known as COBRA) with infrastructure investments and money for clean-energy projects. The Obama Administration has resurrected a proposal the President campaigned on: a $3,000 tax credit per new hire for small businesses, an idea that was dropped from the first stimulus because it would've been too easy for employers to manipulate by firing and rehiring workers. House Financial Services Committee chairman Barney Frank has proposed a $2 billion fund to help homeowners avoid foreclosure. In the Senate, Virginia's Mark Warner wants to use $50 billion in leftover bank-bailout funds for small-business loans (as of the end of October, the so-called TARP program still had $300 billion left). And Senator Jack Reed, a Rhode Island Democrat, has taken inspiration from Germany's successful weathering of the financial crisis and proposed a $600 million fund to subsidize workers who volunteer to have their hours cut back to help companies avoid layoffs. Meanwhile, as the President gathers lawmakers, chief executives and union heads on Thursday at the White House for a jobs summit, business groups are pushing for an array of tax cuts. The National Federation of Independent Business would like to see a payroll tax holiday. The U.S. Chamber of Commerce is asking for a reduction of the capital-gains tax, renewal of popular research and development and other soon-to-expire business tax breaks and a permanent elimination of the estate tax, among a long wish list of tax provisions. The AFL-CIO, the nation's largest umbrella union, would like to see aid to struggling states to help avoid layoffs of teachers, police and public employees and upwards of $500 billion more in targeted infrastructure and green-jobs investment. It proposes paying for this by instituting a stock transaction surcharge of 0.25% per trade  a move vehemently opposed by Wall Street, business groups, House Speaker Nancy Pelosi and the White House. It remains unclear if the House will pass a large catch-all bill or several smaller bills. House leadership had been aiming to pass a bill, or bills, by the end of the year, though majority leader Steny Hoyer on Tuesday indicated that the timeline may slip. "The important thing  my perspective, speaking for Steny Hoyer  is to get a jobs package that will work, not getting one right now," he told reporters. "If we adopt it in the next two or three weeks or we adopt it in January, we need to make sure it'll work." Either way, the Senate cannot pass a comprehensive bill until next year given the current preoccupation with health care. But some of the provisions, such as unemployment insurance, food stamps and COBRA, must pass before they expire at the end of the year. Many Americans, and surely most Republicans, may wonder how it is that Congress is crafting a new stimulus plan less than a year after it passed a $787 billion spending package. And it's not as if that effort has been deemed a failure, or even completely used, for that matter. Less than $200 billion of it has been spent thus far, though money continues to go out the door at a steady pace. The Congressional Budget Office credits the bill with increasing U.S. GDP between 1.2% and 3.2% and estimates that it has created or saved between 600,000 and 1.6 million jobs. Still, given that more than 3 million jobs have been lost since Obama took office  and in that time his approval ratings have plummeted  Congress feels more must be done. Indeed, the Congressional Black Caucus, upset that Main Street, and especially hard-hit black communities, has received little aid compared with the $700 billion Wall Street bailout, last week held up a crucial vote on financial regulatory reform, an Obama Administration priority. And some 128 House members, including 17 Republicans, have banded together to form the Jobs Now! Caucus, working with the leadership to craft a jobs bill. Another factor driving the calls for a second stimulus is that nearly 90% of the original stimulus money targeted for infrastructure projects will have been spent by May, and the Highway Trust Fund could be running a shortfall in June, says House Transportation Committee chairman James Oberstar. "[It] means, unless we do something about it, we'll start losing jobs instead of creating jobs in the construction sector," he says. For that reason, one part of a proposed jobs bill would subsidize 30 states that are unlikely to meet their annual highway commitments next year and would top off the Highway Trust Fund. Pelosi last summer had pushed for a $600 billion six-year highway reauthorization bill, but the Administration and Senate balked at raising gas taxes, which is how the bill is traditionally paid for. Instead, Oberstar and House Appropriations Committee chairman Dave Obey have suggested a smaller, Band-Aid program of $100 billion drawn from general Treasury funds, though Oberstar has also suggested using some of the leftover bank-bailout money. He still hasn't heard anything back on either proposal. "It's like shouting out into outer space  nothing's coming back from the other side of the Hill, nothing's coming back from the other end of Pennsylvania Avenue," he laments. Of course, Congress is pretty busy right now, and not just with health care reform. There are still five of the 12 appropriations bills to pass this year as well as a much-dreaded but necessary measure to raise the federal debt ceiling to $13 trillion. With all these must-pass bills lining up and an imminent sense that the spigot will soon be turned off, Democrats are starting to treat everything as a potential jobs bill. "The appropriations bills can also be looked at as jobs bills," says a Senate Democratic leadership aide. "There's money in them for projects that will create jobs." Indeed, if tradition holds, many of these jobs provisions will get loaded on the back of the annual defense appropriations bill  typically the last bill passed in the year. After all, almost no member of Congress is willing to vote against funding the troops, even if some of that money finds its way back to help civilians at home. Read "Opinion: Here's an Idea Obama Isn't Likely to Hear at His Jobs Summit."